When customers who have never been to Miller Park purchase Brewers tickets, a popular question they ask is, "Where should I sit at Miller Park?" As a Miller Park-going veteran, I often respond with, "there's not a bad seat in the house," which I believe to be true. I've never sat in a seat that I didn't like at Miller Park. 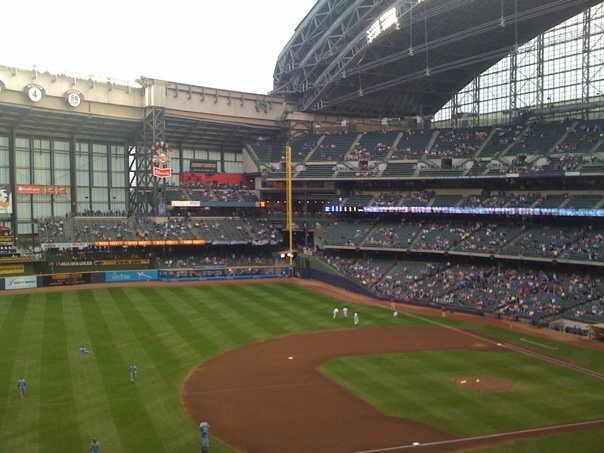 However, when deciding where to sit at Miller Park, I think it's important to first think about what do you, the diehard Brewers fan, want to get out of the game? Do you want to just get into the stadium and mosey around the park? If yes, then I'd suggest getting a ticket for any 400-level seat. That way you can get into the stadium and wander around the park without breaking the bank. Are you trying to catch a ball? If so, then any 100 or 200-level ticket would be best for you. Do you want to see the players' facial expressions? Then, I'd suggest sitting as low as possible in the 100-level between the two dugouts. Do you want Corey Hart to give you a high-five? Then, you should get tickets in the right field bleacher sections. Do you want club amenities? Then, purchase a ticket in the 300-level, which is the club level. 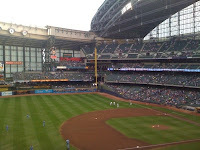 I truly believe that there is no bad seat at Miller Park, so if you've never been to a game before, know that it is impossible to buy the "wrong" Brewers ticket.